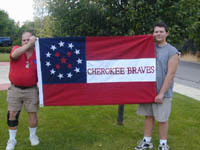 " The words "Cherokee Braves" was the name of Brig Gen. Stand Waite's Regiments as a whole. from "ECHOES OF GLORY, Arms and Equipment of the Confederacy"
This flag was adopted and carried by Confederate Brig. 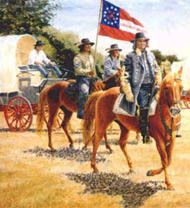 Gen Stand Waite's Cherokee Regiments during the "Civil War". General Waite was the last of the Confederate Generals to cease hostilities-when he signed a CEASE FIRE, NOT SURRENDERED, until a more favorable Treaty could be drawn up and ratified by the U.S. Congress(which still remains undone). 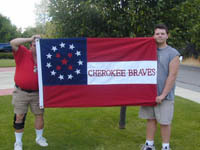 "1st CHEROKEE'S, a unit composed of Cherokee Indians mustered in the Indian Territory in July 1862. the (5) Five Red Stars within the Ring of 11 white ones represent the 5 "Civilized Tribes" - Cherokee, Creek, Chickasaw, Choctaw, and Seminoles - Recognized by the Confederacy". 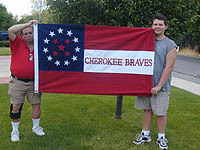 The words "Cherokee Braves" was the name of Brig Gen. Stand Waite's Regiments as a whole. from "ECHOES OF GLORY, Arms and Equipment of the Confederacy"
Same design as above, but sewn on Nylon. 3' X 5' Nylon Sewn Double sided(reads correctly both sides). Same design as above, but Silk Screened on Polyester. 3' X 5' Polyester Silk Screened (reads correctly one side only).